Together with studio photography, there developed a new documentary gender that together with the customs and manners and historical movements of romanticism will create an image of an industrial society in the process of change, very present in its urban forms. These transformations put the monumental heritage that was starting to be valued in a dangerous situation. Therefore, there would soon appear industries that wanted to revolutionize the editorial system, incorporating new reproduction techniques unknown until the moment like photoetching, heliotyping or phototyping that saturated the market with sheets, some of them hand-coloured, portfolios of city views, or with the famous postcard. An example of those first moments were the Photozincographic Society of Madrid (1861) or the Heliographic Spanish Society of Barcelona (1879), despite the fact that in Spain the creation of postcards by particulars was forbidden until 1886. In Guadalajara, there was published a weekly magazine Flores y Abejas (Flowers and Bees) the one who edited the first collection of 16 postcards using the Hauser and Menet printing press. This first edition was followed by others, printed in Roisin’s workshop in Barcelona and in Antero Concha’s, in Alcarria. That one would create its own editions. We must add other initiatives to this editorial success, like the Memorial Guadalajara Collection, composed of 20 remarkable views of the city made by the owner of Gutenberg printing press, Saturio Ramírez, or like the Spanish Photographic Portfolio of A. Martín, and the Spanish Jewels of Admirall. 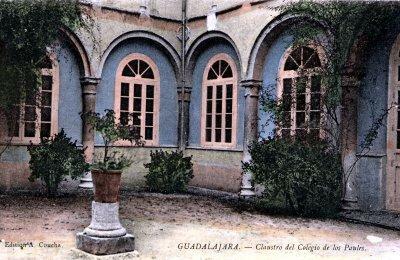 The numbers 16 and 43 from the latter were dedicated to Guadalajara images and its monuments, specially the Infantado Palace. Actually, in the 1917 newspapers, some Guadalajara establishments were announced as postcard workshops: Antero Concha, Tomás Camarillo, Enriqueta Martín, Purificación Navarro, Ligorio Ruiz and María Sorrosal. This editorial phenomenon was also present in the more important villages of the province. In Sigüenza there were published some collections by Hauser Menet, Rodrigo and Roisin, the latter paying special attention to the cathedral; in Molina by the local businessmen Iturbe and Mielgo; in Jadraque, Roig. There was also a portfolio called Brihuega Memorial printed by Cabañas with 15 pictures of Goñi, Trelles, M. Ximénez and F. Brihuega.